Party season for me starts around diwali and goes well till the first week of januray. That is a good stretch of more than 2 months and one of my top essentials for this time of the year is a sequin number. Its definitely the item that catches everyones eyes at parties and i strongly suggest you get a sequin piece for those dressier parties. Having said that i wouldn’t want to have something hang in my closet the whole year and just come out 2-3 times so i decided to style my stunning bodycon dress from NUE for a casual day. Change your shoes to casuals like sneakers or flats. Wear casual accessories like a casual velvet choker or a chunky belt. If styling a top, wear with ripped jeans, boyfriend jeans, shorts in the summer time or culottes. 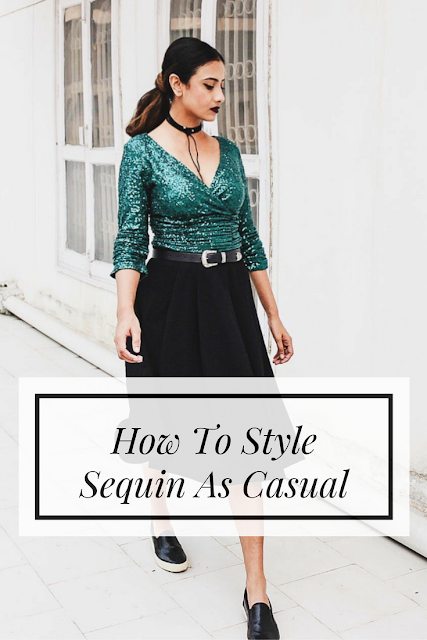 if styling a sequin skirt wear with a graphic tee or sweatshirt, denim jacket or casual sweater. a sequin blazer looks great paired with a plain tee and ripped jeans. if styling a bodycon dress layer a full skirt on top. NUE by Shani is a revolutionary line of flirty dresses with in built compression fabric that is specially woven with spun lycra that shapes and moulds the body, giving the wearer an appearance of a size smaller and allowing her to celebrate her body. Shani, the designer takes the timeless pursuit of enhancing the female shape through tailoring tricks like rusching, darting etc NUE dresses are luxurious and suited to the many roles of modern women and it definitely gave shape to my body without any discomfort. On this day i went out for lunch after the shoot and was quite comfortable throughout. Thank you for stopping by! See you in my next one. Love sequins! I like how you took a dress and turned it into a top! So awesome and great to make two outfits out of one dress! Fabulous looks! Thanks for linking up to Top of the World Style. Great job on having the dress due double duty as a top. It gives an extra outfit. I love the concept! I really like your tip on pairing sequins with denim! I think that would really give a cool look to it with the contrasting feels. Love how you paired the dress with the choker. You look fantastic and you are so right, you did a great job with the "casual" outfit for the sequined dress and then glamorous with the lovely sandals! The first one is great with sneakers and the skirt and the second so chic! Loved the makeup as well! I hope you have a very nice weekend! What a cute outfit! I've been wanting something sequins for awhile. Thanks for the inspo! Your sequin dress is gorgeous! Love the casual look! You look fabulous in this green number. Great tips Chichi. Party season has indeed started and you look fantastic in your green sequin dress. Such a great tip lovely! I love to add the choker too! What a beautiful dress. Love how you styled it. Wow, Chichi, that dress looks amazing on you, girl! I love the color and overall fit, such a beautiful piece and I love how you've styled it both casual and formal. I'm a sucker for sequins this time of year, it just really enhances the overall festive mood we love so much during the holiday season. I have a sequin blazer I love to pair with jeans for a more casual vibe, so I definitely agree with that and all your other suggestions! Thanks so much for sharing, beauty, and I hope you have the most amazing week ahead! Love it! Great way to style it! you look gorgeous in green! love how you mixed up your dress! fantastic idea! that is so cool. I had no idea it was a dress in the first picture! This sequin dress is gorgeous and I love your styling tips to transform it into a casual outfit! You look stunning in both looks and it's great that it is so versatile! Love wearing the bling-bling for the party season! Your berry lips look amazing! Chichi, that is amazing the way you transformed this dress so effortlessly to a gorgeous casual top. The dress by itself is equally stunning! What a wonderful way to get more wear out a sequined dress. I love both looks! Thanks for linking up with me On the Edge! You look amazing girl! This sequin dress is just made for you. And those dark lips are just perfection. I really loved how you paired your dress with a skirt for a casual look. So creative! Great tips my dear! You look fabulous! Pairing with a skirt for a casual look works great! Great choice of lip color as well. Looking very trendy and fashionable...nice combination....way of your dressing style is too good..
WOw - way to dress down your sequins and still look fabulous! Dresses made of sequin fabrics add sparkle and glamour look in any outdoor party.